Yesterday was a very busy day for Kristen Wiig, with movie premieres, interviews and panels at the ongoing Sundance Film Festival on the schedule. She started her day by attending the premiere of Diary of a Teenage Girl, alongside co-stars Alexander Skarsgård, Bell Powley and director Marielle Heller. 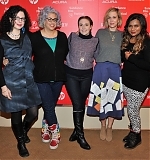 She then continued to a special panel discussion called “Serious Ladies”, featuring Wiig, Lena Dunham, Mindy Kaling and Jenji Kohan. Pictures from both events have been added to our photo gallery. Stay tuned for tons of more pics, videos and reviews from the films coming up soon!